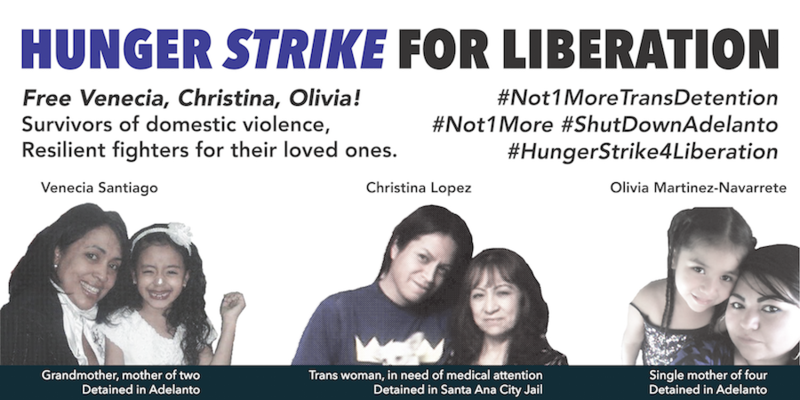 HungerStrike4Liberation Demands the Immediate Release of Olivia A#205970738, Venecia A#079725205, and Christina A#095753915. Olivia and Venecia are currently detained in the corporate GEO owned Adelanto Detention Center while Christina is being held in the LGBTQ section of the Santa Ana City Jail. Olivia, originally fled to the U.S. at the age of 16 due to her father’s physical abuse. Without the proper resources to seek medical and mental care, it was difficult for Olivia to escape the cycle of violence at the hands of her abusive partner here in the United States. There are federal laws and policies like the Uvisa that are suppose to protect women like Olivia but instead ICE wants to deport her. Venecia has been incarcerated with ICE for three years and still remains in custody. She fears for her life if deported to the Dominican Republic. The reason is because Venecia gave useful information regarding the whereabouts of her ex-partner to the FBI due to an investigation they were conducting. Instead of helping her apply for a U Visa, the FBI did nothing to stop ICE from deporting Venecia. She came back to reunite with her children but instead she has not been able to see them due to her deportation proceedings. Christina is a transgender women from Peru who suffers from Hepatitis C. She has made several requests for proper medical attention and they all have been denied. Before she was in detention, she took care of her 32-year old brother who is autistic. He needs around the clock supervision, so Christina would watch him while their mother worked. Her continued detention has been extremely difficult for her brother and her entire family. All three of these women should be IMMEDIATELY RELEASED! There are federal laws and policies that are suppose to protect women and transgender women who are victims of crimes and face violence if deported. The Obama Administration and ICE should exercise prosecutorial discretion and release Olivia, Venecia, and Christina! Please sign below so that Olivia, Venecia, and Christina are released.